Cleaning up your messy rooms can be a daunting task. And if your friends or family members are visiting your home, your stress levels will definitely rise. But you don’t have to worry because these 10 simple and cool tips will help you to finish a lot of work within a short period of time. You just have to have a proper strategy or a simple plan to complete them within your desired amount of time. 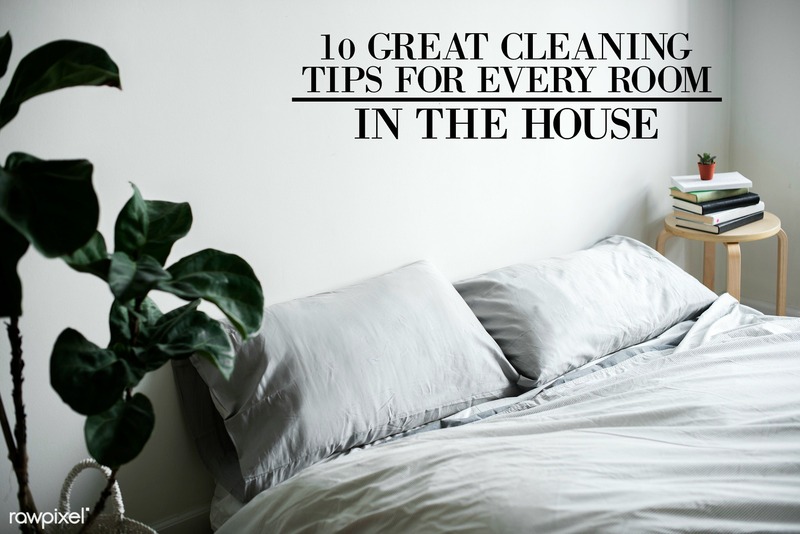 So let’s check out these 10 excellent cleaning tips for every room in the house. Start with a garbage bag. Garbage bags are truly a time saver. So, pick a garbage bag and start gathering all the trash around the home. It’ll help you avoid spills and smudges when cleaning up and make trash clean up so much easier. Make your bed for the clean affect. Making the bed sets the tone for the rest of the day and is an easy way to make a room look clean at a glance. Different nightstand items like knickknacks or lamps should be straighten first. Then keep the kitchen items in the right place. Next, you can pile all your clothes to fold them later. And sometimes we spend all our time searching for the right things. So, if we can keep all the items in their proper place, we can save so much time. If you want to clean all your furniture quickly, then simply use a folded microfiber cloth to wipe them down. Also, microfiber clothes fantastically clean your TV, picture frames, furniture, and bookshelves. How to clean the floor. This one is a crucial step; lots of crumbs and dust settle there. Quickly vacuum the floor to get the grit up. How to clean light bulbs. Your bulbs should be cleaned daily to brighten up your room. Sometimes we clean everything but ignore the lights. Before cleaning the bulb, you have to turn it off to cool it properly. If it’s hot, your hand will be burned while cleaning. So, be careful. Cleaning all the rooms is your top priority. But don’t forget the appliances. Checking your vacuum monthly is needed. Clean the brushes properly so that it can clean properly itself, and make sure to empty it out so you have the best suction possible. Chemicals produce harmful vapors. So stick to natural cleaners like baking soda, white vinegar, etc. instead of using toxic ingredients. Easy ways to clean the kitchen. Your kitchen should be clean and bright as well. So use natural cleaners like vinegar, lemon, or baking soda to clean your entire kitchen. Dishes can be washed by using baking soda and lemon. Avoid using chemicals. Shoes are something that bring dust and dirt into your room. So, keep them by the door so you can cut down on cleaning time later on in the week. Follow these 10 cleaning tips for every room in the house. And if you need some motivation, play upbeat music while cleaning and your work will be done quickly!